I am a chocolate monster. I love chocolates especially Snickers. Since, I was little I have always liked Snickers chocolate bars. 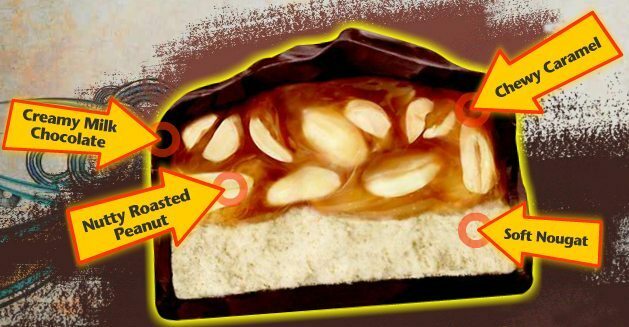 Snickers is packed with roasted peanuts, caramel and milk chocolate in a delicious energy bar. I love this perfect combination! I eat Snickers Chocolate bar if I need a quick energy boost especially if I am working late or feeling tired. So my grocery list will not be complete without Snickers. 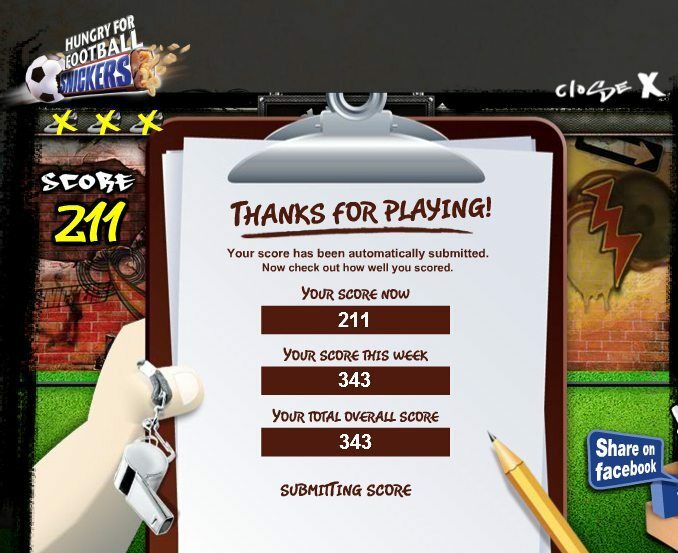 Anyway, Snickers is now having an online game called “Hungry for Football” where you can win iPod touch and Sony PSP. Starting April 1 up to May 15, 2010 (in the Philippines), 5 iPod Touch units will be given away weekly while 3 Sony PSP units will be handed to lucky winners as Grand Prize. This contest is open to all citizens of The Philippines, Malaysia and Singapore aged 18 and above, except employees of MARS (the company that distributes Snickers) and its advertising agencies among other suppliers*. Join the contest as many times as you want. But weekly winner/s can only win one prize per week. The contest runs from March 1 – April 15 in Singapore and April 1 to May 15 in The Philippines and Malaysia. 5 lucky winners, based on highest accumulated points, will be chosen from each country weekly. 3 Grand Prize winners based on TOP highest scores, on the other hand, will be chosen for the whole run of the promo. Winners will be notified via email to claim their prizes. 1. Type the alphabet that lights up on your screen to build up power. The quicker and more accurate you type, the quicker your power builds up. 2. Building up power in the shortest amount of time earns you more points when you score a goal. 3. To kick, press SPACEBAR on your keyboard. You can choose to kick the ball at any point in time. Type in SNICKERS when you see the word light up. 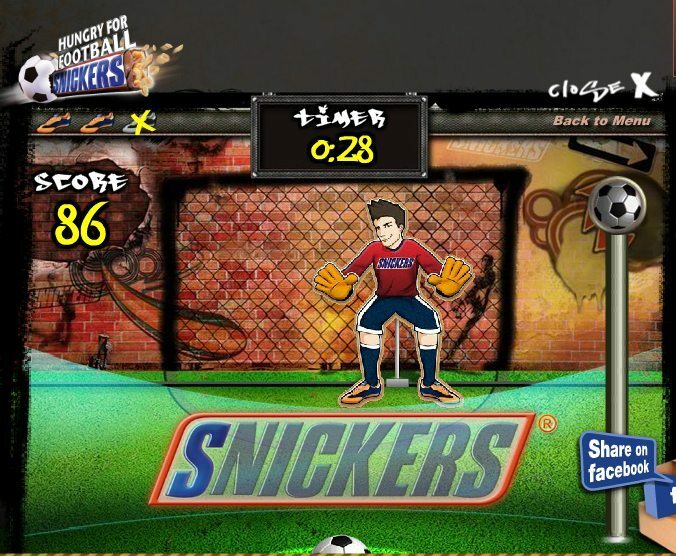 A bite of SNICKERS will immediately boost your power to score a winning goal with 50 points! So what are you waiting for? 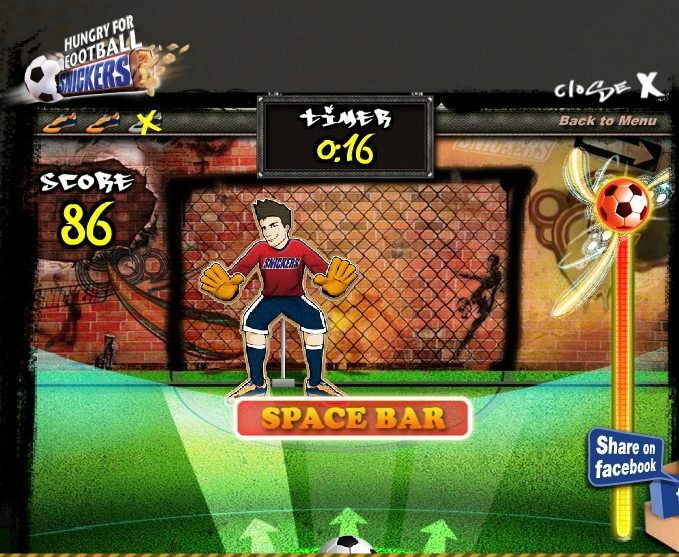 Join Snickers Hungry for Football Online Game, and keep revisiting the game to accumulate points.